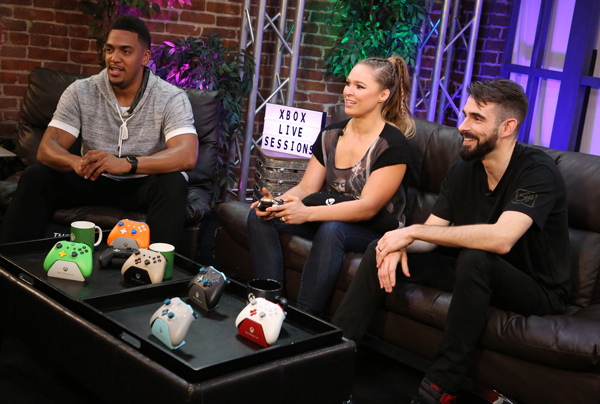 American mixed martial artist, model and actress Ronda Rousey joined Xbox Live Sessions as a featured guest on the interactive, livestream show on the Mixer Xbox Channel. Rousey, a huge gamer, got to experience true power for the first time as she played "Assassin's Creed® Origins" on the Xbox One X just hours before the game was released. Host and Microsoft Studios Community Manager Rukari Austin joined Rousey as they discussed how her love of video games grew from childhood. Rousey was in her natural element throughout the stream, regularly talking about how she plays Xbox everywhere she can, whether it's with family at home, gaming nights with friends or even on the set of Furious 7 with Vin Diesel. A true gamer, Rousey performed well while playing Assassin's Creed® Origins but, she did admit she wouldn't make the best assassin. When asked by a viewer, "What makes a perfect assassin?" Rousey said, "They would have no attachments or feelings towards anyone. I could never be a good one because I have too many people I care about." Rousey also discussed her amazing experience visiting Egypt, the setting for the game, and her desire to be a character in the game. At the end of the livestream Rousey offered advice to anyone trying to do something extraordinary, similar to making the Olympics at the age of 17 like she did, "You have to be willing to get your heart broken, because you have to care that much." Fans should continue to be on the lookout for other Xbox Live Session announcements with more athletes, actors and musical talent coming soon.